At Ultimate Beauty Laser Spa our goal is to make long lasting beauty possible! Our highly trained Medical Estheticians are the best in the Rochester and Needham regions. Our Candela and Cynosure lasers are the Gold Standard in the industry and FDA-approved. The GentleMax Pro lasers work on virtually any part of the body and skin type. We’ll walk you through the process step-by-step in our beautiful, private office and provide you with everything you ever wanted to know…but were afraid to ask! LASER – Light Amplification by the Stimulated Emission of Radiation is a device that produces intense beams of pure colors of light, converting electrical energy into light energy.This is where the story begins, when it comes to laser hair removal because without LASER, permanent hair removal would not exist. Your hair color: Your hair must be dark enough – light brown, medium, dark brown or black. In some case auburn hair can be treated as well. Medications: Some medications don’t mix with laser hair removal. We can discuss this with you during our free consultation. Skin-type: A thorough skin-type analysis will be reviewed with you. The laser light is most effective on darker hair as the target is the melanin in the hair follicle, so the darker the hair the easier it is to remove permanently. Think of it this way, laser works because dark colors absorb light. For example, when you wear a dark shirt in the sun you are warmer than you would be if wearing a white shirt. As a result, laser does not work on white hair and very light red hair. Laser light heat is absorbed into the follicle and by the melanin and stops the hair from growing without hurting the surrounding tissue(skin). The laser is designed to protect the surrounding tissue with a built-in dynamic cooling system that protects the skin and the precise timing allows the laser light to destroy the hair follicle. What medications or use topical ointments do you use daily? This is very important because many prescribed and even herbal supplements can cause photosensitivity. The Fitzpatrick scale is a very helpful tool that is used to determine skin color and sun sensitivity but does not necessarily correlate with all ethnic groups. This information is part of our formula to laser all skin types properly. Two weeks before and two weeks after a laser treatment the area must be protected from the natural sun completely. For skin types, I II III, waiting longer may be required. A laser treatment does not take long. Depending on the area of the body your laser treatment takes 15 minutes to one hour. Please note that full body laser treatments are a longer duration or in some cases broken up into two different appointment time. Session durations are determined by the technician during your initial consultation. In order to achieve permanent laser hair removal, we may require anywhere from 6 to 10 sessions. However, there are many factors that determine how many treatments are required. This is why a thorough assessment is required, as everyone is different. There are three stages of hair growth that determine the effectiveness of the laser hair removal treatment. Anagen, or growth phase. Catagen, or transitional phase. And finally Telogen, or dormancy phase. 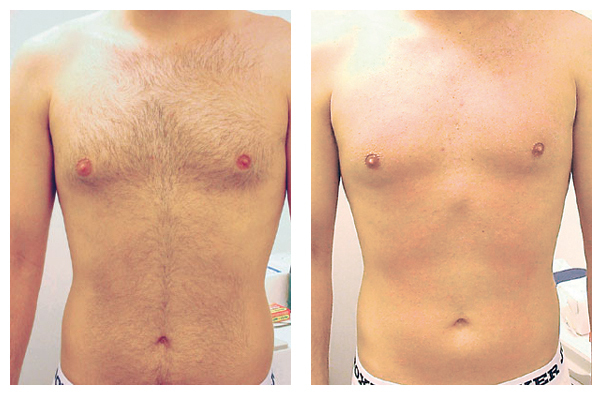 The laser hair removal treatment is most effective during the Anagen, or growth phase. The patient can only determine this phase by observing the hair growth on the surface of the skin. The longevity of the Anagen phase differs for each body location. The pubic area duration is approximately 5 to 6 weeks between treatments while the legs can be 2 to 3 months. How do I know the laser treatment will be safe for me? Often a test on your skin is performed in any area of the body and in areas that may be of concern with the skin’s reaction to laser treatment. We perform test spots in inconspicuous areas – lateral sides of the face, inner arm, under chin as a for instance. We test different energy levels to know individual tolerance to each laser setting. We are sure to document the energies and location of the test and will re-evaluate the areas in one to two weeks. If there are no adverse effects, dyspigmentation, or other changes in the skin that are not typical proceed with the treatment. It is recommended that you shave the area 24 to 48 hours prior to treatment. You must not tweeze, wax, or pluck the treatment area for at least 4 to 6 weeks prior to a treatment, if possible. The treatment area must be free of make-up, lotion, deodorant, and ointments. In other words, it must be “squeaky clean”. Ensure the skin is dry prior to a treatment as well. What will my skin look like during and after a treatment? Our technicians will line the area with a white make up pencil in many cases, especially in larger areas such as the legs and backs that help to guide the treatment process. The skin will be “smelly, bumpy, pink.” This is called perifollicular edema. This is what we call a typical clinical endpoint. If you are not seeing a clinical endpoint, the fluence/energy used will be adjusted. The redness may last for a few hours or up to several days following a treatment, since skin sensitivities vary. In some cases, the swelling or edema can be itchy post treatment. The patient should use hydrocortisone or Benadryl to alleviate this. An oral, non-drowsy antihistamine can also be used. You can apply deodorant or make-up to the area post treatment if the skin does not feel irritated. PCOS (polycystic ovarian syndrome) is the most common female endocrine disorder, affecting 10% of women of reproductive age. Consulting with your physician is a first step and/or seeking alternative solutions is highly recommended. PCOS causes a multitude of symptoms including; Hirsutism which is increased hair growth on the face, chest, stomach, back, thumbs, or toes. Excessive hair growth can be merely annoying and sometimes truly devastating. Laser Hair Removal can help with your increased hair growth issues. Sadly, there is no cure but studies have shown that symptoms can be minimized with dietary and lifestyle changes. So if you want fast and effective hair removal, call Ultimate Beauty Laser Spa today and book a free laser hair removal consultation. Fairport (585) 421-9099 or Needham (781) 449-2842.